Buying a home is, more than likely, the most expensive purchase you will ever make. This is no time to shop for a cheap inspection! The cost of a home inspection is very small relative to the value of the home being inspected. 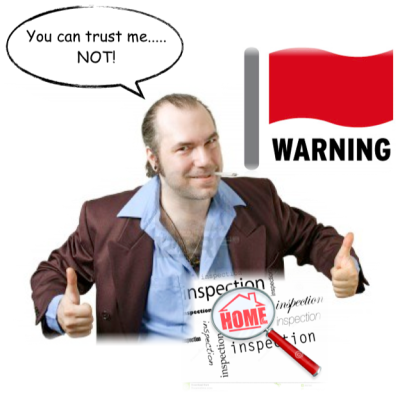 The additional cost of hiring a licensed, certified inspector is almost insignificant. As a home buyer, you have recently been crunching the numbers, negotiating offers, adding up closing costs, shopping for mortgages, and trying to get the best, most quality deals. In short, you've been proceeding like a smart, responsible adult. Don't stop now! Don't let anyone talk you into "skimping" here. You need someone who knows what they are talking about; someone who is educated about what to look for in order to assure you and your family are safe and sound in your new home. Please be warned, if you have someone tell you they can inspect your house in about 30 minutes for around $200, RUN AWAY!! Consider this your "red flag" warning. The money you saved on a cheap home inspection will more than likely cost you lots of money down the road.